Jean-Baptiste-Camille Corot was born July 17, 1796 in Paris, but immediately placed in the care of a nurse in Presles near L’Isle-Adam where he remained until age four when he was reunited with his parents. [i] Although it is unusual for parents to entrust their children to caretakers during their early childhood today, it was a relatively common practice among comfortably middle-class French families in the late eighteenth century. Corot’s parents both came from economically successful bourgeois backgrounds and during the early years of their marriage, they were intently focused on establishing a prosperous millinery business in Paris. In this they were very successful; Mme Corot’s shop near the Place Royal provided fashionable hats to the Empress Josephine and her attendants. Throughout their lives, Corot’s parents not only supported their three children in comfort, but were able to provide them with financial stability in the form of annual stipends during their adult years as well. The young Corot attended the local boarding school from 1803-1807, and then received a scholarship to a secondary school in Rouen. There, he was an indifferent student, and ironically showed no interest at all in art. By all accounts, he seems to have been a shy boy who enjoyed long rambles in countryside of Normandy. 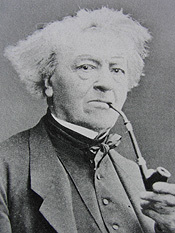 From 1812-14, he was at boarding school in Poissy where he finished his formal schooling before returning to Paris. Once back in Paris, Corot’s father arranged for him to work at a cloth merchant’s shop, but he soon transferred to the shop of another cloth merchant, Delalain, where he would remain for the next eight years. Although it was an unconventional art education, Corot’s years in the textile industry taught him about colors, patterns, textures and design; and it was then that he began to explore painting as a possible career. His father was unenthusiastic about this idea, believing that a career in art was a pathway to poverty. Despite this belief, however, Corot’s parents had a change of heart after the death of their youngest daughter, Victoire-Anne, in August 1822. At that time, the 1500F annual stipend that would have gone to his sister was transferred to Corot—and remained in place until the death of his mother in 1851. The financial security that this sum provided not only allowed Corot to pursue his painting, but also to buy supplies and food during the early decades of his career. By late in 1822, Corot was able to quit his job at Delalain and rent a studio on the quai Voltaire, not too far from his parent’s home. He had been sporadically attending classes at the Académie Suisse, but switched to the studio of Achille-Etna Michallon (1796-1822), a well-respected landscape painter, in 1822. Corot seems to have been certain about his desire to paint landscapes. He focused on this genre from the beginning of his artistic career, and consistently chose to study with specialists in the field. Sadly, Michallon died only a month after Corot began studying with him, thus forcing the young painter to move the studio of Jean-Victor Bertin (1775-1842), who was probably the most well known landscape instructor in Paris at the time. Corot’s formal artistic training was grounded on the neoclassical foundations of the French Academy in the early 1800s, but he was equally aware of the more romantic landscape aesthetic being practiced in the 1820s by painters such as Georges Michel (1763-1843) as well as the realistic work of early Dutch and Flemish masters. During the course of his studies, Corot also followed his instructors’ directions to paint outdoors in front of nature. His hikes through the forest of Fontainebleau and near his parents’ house in Ville-d’Avray began at this time—and continued to the end of his long life. The importance of Italy cannot be underestimated in terms of Corot’s aesthetic education, especially the role of light in revealing form. The sheer sensual beauty of the southern sun enchanted him even in an early, and relatively awkward, work such as Rome: The Fountain of the Académie de France (1826, Private collection) in which he reveals the classical fountain in a blaze of light as if under a spotlight on stage. Within a few months, he was painting more sophisticated and elegant works such as Narni: The Ponte Augusto over the Nera (Musée du Louvre, Paris). In 1827, he sent his first paintings to the Salon in Paris, making his debut with Vue Prise à Narni (National Gallery of Canada, Ottawa) and the La Cervara: The Roman Campagna (Kunsthaus, Zurich). Corot remained in Italy until 1828, when he returned to Paris, again via Venice and Switzerland. The years between 1828 and 1834 are less well documented than the first Italian period, but the paintings from this time reveal frequent travels throughout France, a very close study of seventeenth century Dutch and Flemish art, and a new awareness of the contemporary English landscape school. This is also the period when Corot began to study portraiture. Quite naturally, he began with portraits of friends and family, for example, painting each of his nieces on their sixteenth birthdays. Throughout these years, Corot also submits his work regularly to the Salon, showing four paintings in 1831; one in 1833; and two in 1834. In May of 1834, he leaves France to spend six months in northern Italy, this time traveling to Venice, Florence, Genoa, Milan, and the Italian Alps. The following decade was one of intense production for Corot, a period in which he also developed his own stylistic voice as a landscape artist. As always, he traveled extensively in France, ranging from Normandy to Provençe exploring the topographical, ecological and lighting conditions of different regions. Back at his studio in Paris, he continued to create large Salon paintings based on mythological and occasionally religious themes, but increasingly these works were exclusively landscape paintings. In 1843, he made his last journey to Italy, living in Rome with friends and painting consistently from May to October. If Rome was a touchstone for Corot, the forest of Fontainebleau was a perpetual source of inspiration, and in the 1840s, he spent an increasing amount of time there. During the mid-1840s he became friends with the Barbizon painter, Théodore Rousseau (1812-1867) who proved to be a significant influence on Corot’s evolving landscape aesthetic. Later, he would become an especially close friend of Charles-François Daubigny (1817-1878); the two men occasionally traveled together in the quest for landscape motifs. At the 1846 Salon, he exhibited only one painting, View of the Forest of Fontainebleau, (Museum of Fine Arts, Boston). In July of that year, he was also named a Chevalier of the Legion of Honor in recognition of his profound influence on the development of landscape painting. The 1848 Revolution ushered in a new liberalism to France, and in particular to the art world politics of Salon exhibitions. Reform of the jury system was crucial to many artists who worked outside the prescribed rules of the Ecole des Beaux-Arts, and Corot was actively involved in writing the new criteria for acceptance at the annual Salon exhibitions. Subsequently, he was elected to the juries for the Salons of 1848, 1849 and 1850-51. During the short-lived Second Republic (1848-1852), Corot exhibited a total of eighteen paintings at the Salons. The decade of the 1850s opened sadly with death of Corot’s mother (his father had died in late 1847), but it also marked the beginning of a prolonged period of ever more frequent traveling. Once he was released from the responsibility of caring for his aging parents, Corot became a remarkably peripatetic artist, constantly on the move in search of fresh imagery. Typically, these painting expeditions included frequent stays with friends or family with homes throughout France and Switzerland. In the middle of the decade, Corot submitted six of his paintings to the Exposition Universelle in Paris, and won a first-class medal for his exhibition. By the end of the decade, his reputation as one of the leading landscape painters of the time had attracted the attention of a younger generation of artists, many of whom sought him out as a teacher. In addition, his work was increasingly attractive to art dealers and a handful of collectors in the United States. Corot’s status as a major force in landscape painting will only continue to grow during the 1860s and 1870s. Private galleries were eager to purchase his work, with the New York City branch of the Goupil Gallery being the first to exhibit his painting publicly in the US. By 1866, the Fine Arts Gallery in New York, in association with the art dealer Alphonse Cadart, hosted the first exhibition of modern French art, including ten works by Corot; this exhibition subsequently traveled to Boston and Philadelphia. In fact, Corot’s work was shown not only in the US during the 1860s, but also at the Royal Academy in London, the International Exhibition in Munich, and at the 1867 Exposition Universelle in Paris. Honors and awards were abundant in these years including being made an Officer of the Legion of Honor (1867), and a Knight of the Order of St. Michael, First class (1868) by King Ludwig II of Bavaria. [i] Corot’s birth certificate recorded his birth date as July 16, but was later corrected by hand to read July 17, 1796. For more information, see Corot, Gary Tinterow, Michael Pantazzi and Vincent Pomarède, ex. cat. Metropolitan Museum of Art, New York, 1996, (New York: Harry N. Abrams, Inc., 1996) 409. [ii] The letter was written from Papigno Italy on August 8, 1826 to Albo Osmond. The original can be found in the Département des Arts Graphiques, Musée du Louvre, Paris. A.R. 8 L5. See also, Corot, Gary Tinterow, Michael Pantazzi and Vincent Pomarède, ex. cat. Metropolitan Museum of Art, New York, 1996, (New York: Harry N. Abrams, Inc., 1996) 410. For a discussion of Corot’s love of Roman women, see 19-20.